Have you ever wondered what it would be like to travel the world… To play the “nomad game”… Seeing different sights and experiencing different cultures of people living in foreign countries? Have you ever wondered how an experience like that could change your perception of life – or even how it could inspire you to create and run a business? 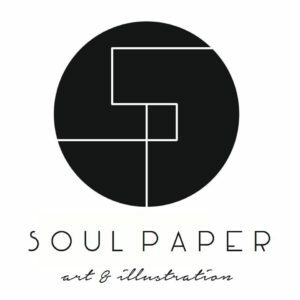 My guest today is Alexandra (Alex) Matthews, owner of the Etsy shop Soul Paper Art. Alex had the opportunity to travel the world at a fairly young age – fresh out of college and she has seen the beautiful landscapes and inspirational cultures throughout New Zealand, Australia, Bali, as well as Europe. Although Alex had an Etsy shop before she decided to see the world, it was after she returned from living the dream life of an explorer that she hunkered down and focused on growing her business. In her Etsy shop Soul Paper Art, Alex creates and sells beautifully hand-crafted state maps, greeting cards, and illustrations. She shares her journey with me, from touring the world to re-designing her shop and website, as well as what techniques she uses – both online and offline – to grow her business and get her name out there. Alex has a unique view of business, life, and the world in general. Through her traveling experiences, she has found the inspiration she needs to continue creating. Although, like many creative entrepreneurs, she admits to sometimes feeling isolated, she shares how she overcomes that feeling of isolation feeling. We also discuss how she manages her time between working full-time in marketing for a home building company while running a successful business. Alex’s story is truly inspirational! Please take a minute to subscribe and leave an honest review of the podcast in iTunes and Stitcher. That really helps to get the word out about the show. Facebook Group: Etsy Conversations – This is where I’m connecting with you after the podcast. Lots of fun convos here too!